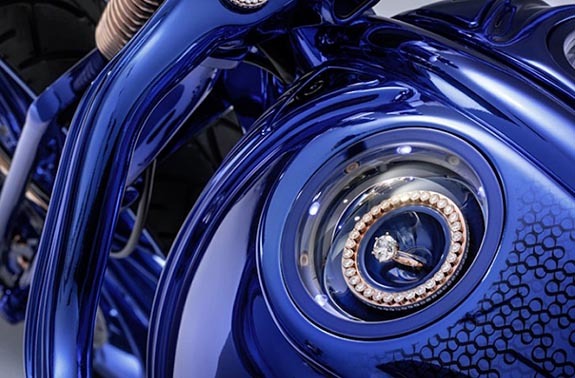 Luxury Swiss watch and jewelry brand Bucherer has teamed up with Harley-Davidson customizer Bündnerbike to create the blingiest, most expensive motorcycle in the world. 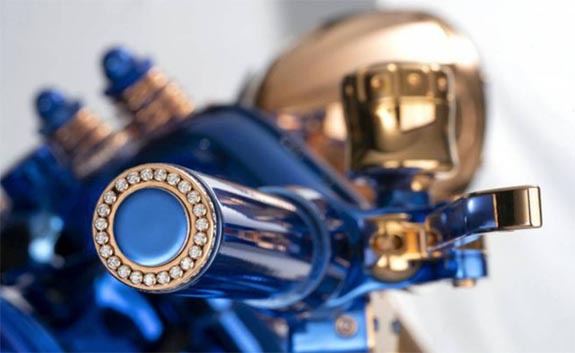 The $1.9 million "Blue Edition" Harley-Davidson is adorned with 360 diamonds, including a 5.4-carat diamond ring displayed under an armored glass compartment built into one side of the tank. Located under a second dome on the opposite side of the tank is a Carl F. Bucherer custom-made watch. 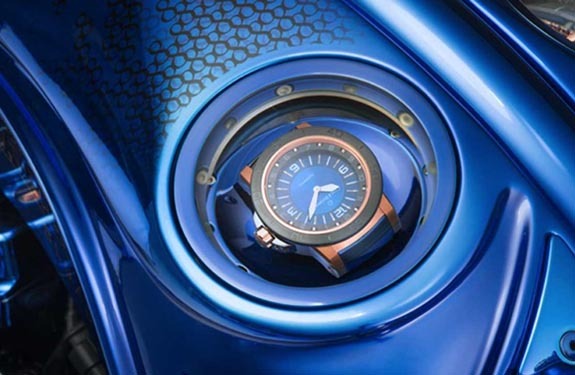 The dial of the watch boasts design elements of a motorcycle engine, and to ensure that vibrations do not damage the mechanical movement, the watch is housed in a cage with an elaborate holder made from silicon rings. The cage also serves as a watch winder. Bucherer's unique "Dizzler" rotating diamond rings are seen in a number of places on the bike, including smaller ones on the handgrips and forks and a larger one on the left half of the tank. Other parts of the bike are plated in rose gold, including the throttle valves, headlight and screw heads. Bündnerbike started with a Harley-Davidson Softail Slim S and then stripped it bare. Every metal element was welded, beaten, ground and polished by hand. The bike is even equipped with two retractable safes. The iridescent blue color was achieved by first silverplating the entire motorcycle and then adding six coats of paint using a secret method. 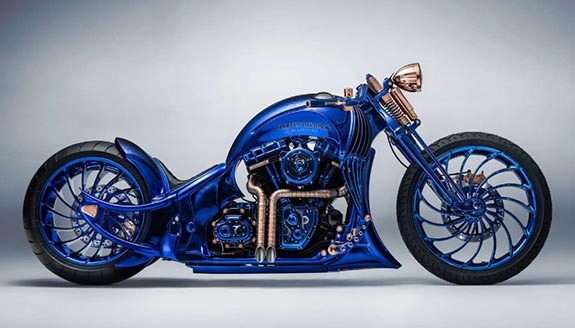 It took a team of eight specialists 2,500 hours to put together the Blue Edition Harley-Davidson. The dazzling bike is currently on display at the Bucherer London boutique within Selfridges department store. In a few weeks, the Blue Edition will embark on an extended tour that will take it to a number of other Bucherer outlets throughout Europe. Utilizing an unmanned submersible vehicle at a depth of 600 meters, researchers at the Woods Hole Oceanographic Institution (WHOI) positively ID'd the San José — a 62-gun, three-masted Spanish galleon that has been called the "Holy Grail of Shipwrecks." 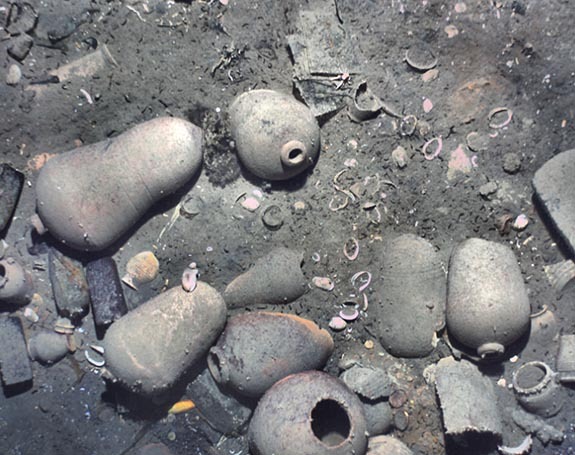 The ill-fated ship had been en route to Spain in 1708 laden with a cargo of emeralds, precious-metal coins and jewelry estimated to be worth $17 billion. 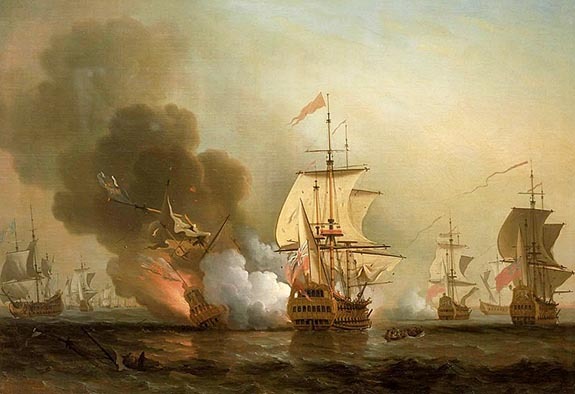 A quartet of British warships sank the galleon near Colombia's port city of Cartagena, and for hundreds of years, treasure hunters speculated about the exact location of the wreck and the untold riches it contained. WHOI researchers maneuvered the REMUS 6000 robotic submarine to within 30 feet of the wreck — close enough for cameras to capture images of the distinctive dolphins engraved on the ship's massive bronze cannons. 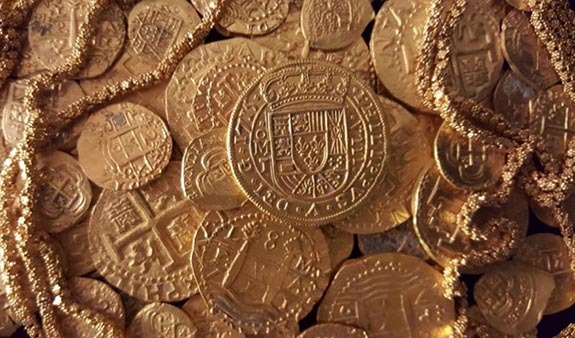 When they are finally recovered, the gold coins of the Galleon San José are likely to look similar to these specimens salvaged from a 1715 Plate Fleet wreck off the coast of Florida. 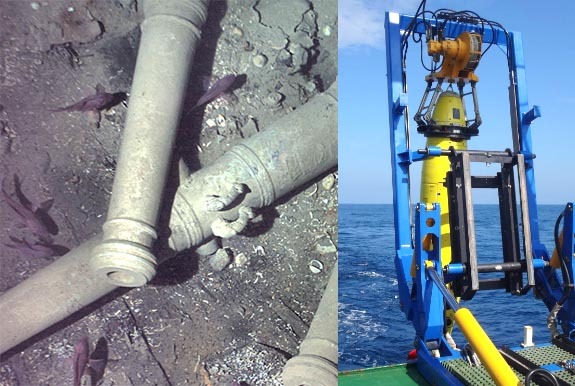 “The wreck was partially sediment-covered, but with the camera images from the lower altitude missions, we were able to see new details in the wreckage and the resolution was good enough to make out the decorative carving on the cannons,” said exhibition leader Mike Purcell in a statement. This is not the first time the REMUS 6000 has been called on for a high-profile assignment. In 2010, it assisted in mapping and photographing the Titanic wreck site in the North Atlantic Ocean. Researchers believe that all the San José's treasures remain intact. The Colombian government is currently raising funds for the recovery effort that should yield millions of gold and silver coins, as well as fine jewelry and a bounty of Peruvian-mined emeralds. It also plans to build a museum and world-class conservation laboratory to preserve and publicly display the wreck’s contents. The San José discovery carries considerable cultural and historical significance because the artifacts may provide a clearer picture of Europe’s economic, social and political climate in the early 18th century. Although the exact location of the wreck remains a Colombian state secret, the Associated Press previously reported that the ship was believed to have sunk along the coral reefs near Colombia’s Baru peninsula, about 16 miles south of Cartagena. The San José was part of Spain’s royal convoy taking colonial riches to King Philip V during the War of Spanish Succession (1701–1714). Of the 600 people aboard the doomed San José, only 11 survived. Credits: San José battle painting [Public domain], via Wikimedia Commons. Coin photo via Facebook/1715 Fleet – Queens Jewels, LLC; REMUS image by Mike Purcell, courtesy of Woods Hole Oceanographic Institution. Ocean floor images courtesy of Woods Hole Oceanographic Institution. 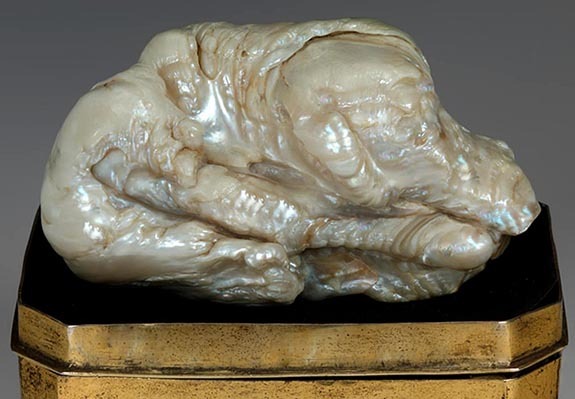 Once owned by Catherine the Great, the world's largest known freshwater blister pearl is expected to fetch more than $600,000 when it hits the auction block in The Netherlands this Thursday. 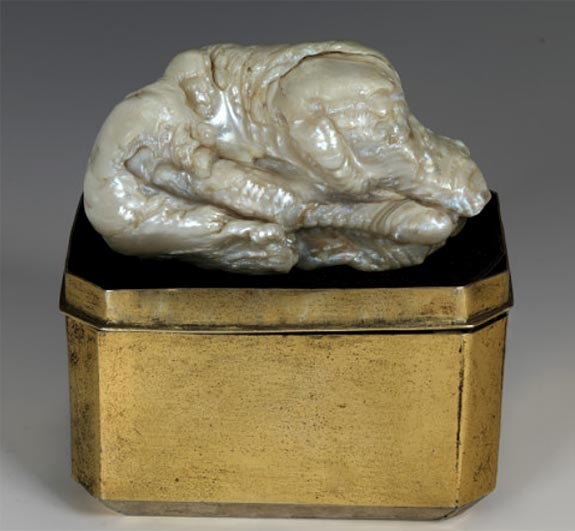 Dubbed "The Sleeping Lion" due to its unusual shape, the extraordinary quarter-pound natural pearl is more than 2.7 inches long and was likely formed in China between 1700 and 1760. For approximately 250 years, the pearl has traveled the world as it changed hands among global merchants, noble jewelers and European royals. According to the Venduehuis auction house, The Sleeping Lion was found in southeastern China — perhaps in the Pearl River — during the Qing dynasty. And even though Chinese Emperor Qianlong enforced a ban on exporting large pearls, The Sleeping Lion was moved by Dutch merchants to Batavia and then to Europe. In 1765, Hendrik Coenraad Sander, the accountant for the Dutch East India Company, became the first European owner of The Sleeping Lion. After his death, the pearl was auctioned off in Amsterdam in 1778 and acquired by Catherine the Great. The Empress of Russia placed the piece in the Hermitage Museum in St. Petersburg, where it was on public display until 1796. In 1865, Lodewijk Willem van Kooten, a goldsmith working for the Italian court jeweler, Catellani, purchased The Sleeping Lion and brought it to Amsterdam two years later. For the next four generations, the pearl would remain in the possession of the prestigious Dutch jewelry family. The Amsterdam Pearl Society purchased the pearl in 1979 with the goal of researching The Sleeping Lion's composition and history. On Thursday, the Society will be offering the pearl for sale during the Venduehuis auction in The Hague. The Venduehuis der Notarissen is the oldest Dutch auction house, founded in 1812. The Sleeping Lion is considered a blister pearl, which means that it formed while attached to the inside surface of a mollusk's shell. This causes blister pearls to be flat on one side. Coming off a three-day viewing in The Hague, The Sleeping Lion will be Lot 1778 at Thursday's auction. Venduehuis estimated the piece would sell in the range of $395,000 to $628,000. The pearl is being offered along with its original custom-made brass case. Credits: Images courtesy of Venduehuis.